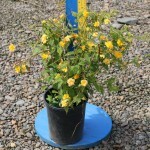 A large fine textured arching shrub with bright green foliage and golden yellow double flowers that resemble tiny roses. The stems are a bright green and are quite showy in winter. Blooms in spring and sporadically all summer. It will take a wide range of soils except heavy clay. 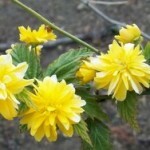 It prefers part shade and is tolerant of heavier shade. Plant in the shrub or woodland garden where some shade is provided.